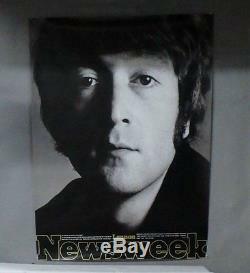 100% ORIGINAL SUPER RARE VINTAGE NEWSWEEK UNPUBLISHED ISSUE JOHN LENNON OF THE BEATLES ADVERTISING POSTER. THIS PHOTO WAS USED ON THE COVER ISSUE OF NEWSWEEK DEC 22, 1980 RIGHT AFTER HIS DEATH. BUT THE INTERVIEW FOR NEWSWEEK TOOK PLACE IN SEPTEMBER BEFORE HIS DEATH, AND TALKS ABOUT HIM DOING A COME BACK FOR HIS SON. I BELIEVE THAT NEWSWEEK WAS TO PUBLISH A JAN 1981 ISSUE USING THIS PHOTO, AND THE INTERVIEW. BUT DAYS AFTER HIS DEATH THEY CHANGED THE ISSUE RELATING TO HIS DEATH USING THE SAME PHOTO IMAGE ON THE COVER FOR THE DEC 22, 1980 ISSUE. IF YOU NOTICE ON MY ADVERTISING POSTER IT IS DATED 1981. I BELIEVE THIS POSTER WHICH WAS MADE FOR SUBWAY OR BILLBOARD WAS TO BE USED FOR ADVERTISING THAT JAN, 1981 ISSUE THAT WAS NEVER PRINTED DUE TO HIS SUDDEN DEATH. ALL ITEMS ON MY SITE ARE GUARANTEE TO BE 100% VINTAGE, AND NOT REPRODUCTIONS. The item "SUPER RARE VINTAGE NEWSWEEK UNPUBLISHED ISSUE JOHN LENNON OF THE BEATLES POSTER" is in sale since Thursday, June 23, 2016. This item is in the category "Entertainment Memorabilia\Music Memorabilia\Rock & Pop\Artists B\Beatles\Posters".